If Donald Trump Can’t Stop Donald Trump, Who Can? 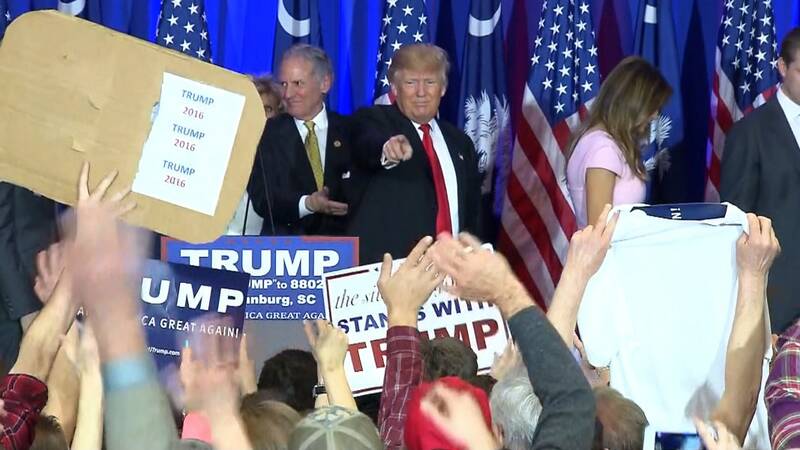 Donald Trump won South Carolina while doing seemingly everything in his power to lose. That is a scary thought if you’re a Republican trying to beat him on March 1, when a slew of southern contests could give him a substantial boost to the nomination. With 99 percent of precincts in, Trump took 32.5 percent of the vote on Saturday, far ahead of Sen. Marco Rubio and Sen. Ted Cruz. His dominating win delivered all 50 of South Carolina's delegates. Watching Trump the last week, it was tempting to assume he had made a bet with a friend that he could sabotage his campaign as frequently and needlessly as possible and his supporters would stick with him. Or maybe that even he realizes things have gone too far at this point and he wants out. The aura of infallibility he’s developed after blowing through expectations during the election ensured no one would declare a meltdown, but if there was a method to his madness, it was hard to single out in real time. Entering South Carolina with a dominant lead, Trump could afford to play things relatively safe like he did in the lead-up to New Hampshire (well, sort of). Instead, he needlessly tweaked GOP dogma and feuded with everyone from the last Republican president to Pope Francis while running after every shiny object in the news that caught his eye. He accused George W. Bush of lying his way into Iraq and blamed him for not preventing 9/11. He dumped on House Speaker Paul Ryan on Wednesday. He seemingly endorsed Obamacare’s insurance mandate on Thursday and then walked it back on Friday. Republican voters, who have a nuanced view of President George W. Bush already, proved willing to set aside their old affection when choosing their nominee. He distracted from potentially unsettling news with wild tangents, like calling for an Apple boycott or threatening Cruz with a lawsuit or insinuating President Obama was a Muslim (yet again). He shrugged off old interviews showing that he supported invading Iraq in 2002 and called the invasion a success in 2003, both of which undercut his already entirely unsubstantiated claim that he opposed the war. His closing message on Friday was an unfocused mess of a speech that included a depraved celebration of war crimes in which he repeated an urban legend about Gen. John Pershing massacring dozens of Muslim prisoners with bullets dipped in pig blood. So far he has never gone wrong selling fear and bloodlust, and Saturday was no exception. Republicans are now on the precipice of nominating a candidate with virtually no institutional support from the party running on blatant appeals to bigotry, joyful celebrations of torture, and a complete contempt for the pieties of movement conservatism. Even Trump sounded more surprised than thrilled with this development on the eve of voting. Now the pack is behind him and Trump’s supporters are proving his boast that he could shoot a stranger in the middle of Fifth Avenue without dropping in the polls. There are still obstacles ahead. Rubio and Cruz broke away from the rest of the field in South Carolina and have a chance to turn this into a three-man race. But Trump’s coalition is real, it’s voting, and the field has had eight months to find a tool that can crack it without success. They have fewer than two weeks to find one now.